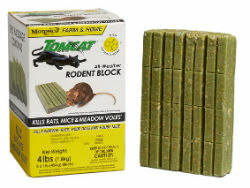 A proven, popular way to control rats and mice. They provide economical control using the active ingredient Diphacinone, a multiple feed anticoagulant that has delivered proven results for more than 25 years. Good for light to moderate infestations. Peanut flavored for maximum bait acceptance and performance. Each box contains 4 individually wrapped 1 lb. Bars of Bait and can be used indoors and out. Only sold in a case of 4 boxes.